Just as I step onto the trail, right there under my feet, is a tiny exquisite feather. Not quite a centimetre long, the feather is lustrous. At the quill end it's a fluffy pale grey which turns into a deep tangerine, pales into a rich orangey-yellow, bleeds into a light olive greeny-yellow and then, in miniature tufts, is transformed into a bright emerald green. A very small and precious gift from the Rainbow Lorikeet - the colours of the feather imitating its name. Early in the day in the warmer months, the river valley is often slightly foggy. But as the sun breaks through and the light dances on the water, the river's colours begin to sparkle. Gradually the river takes on the quality and colour of its surroundings. It shifts from a dark khaki to a browny-olive then spreads to a honey earthy brown, even to delicious shades of darkish green. But when the fog lifts and the sky changes from misty greys to an intense bright blue, the river's colour changes again and reflects the beauty of blueness. 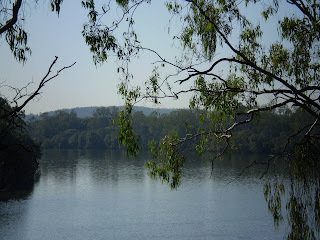 Above me, in the quiet of the river's stillness, the white Cockatoos are scruffling raucously. They seem perturbed, agitated somehow and are shrieking and screeching, intent on one particular tree. It is a narrow eucalypt about five to six metres tall, full of hollows. The Cockatoos peer closely into the openings, then they fly up and back and look deeply into the hollows again, all the while vocalising. What is in the tree hollows? And why are the birds screeching so loudly? From White Cockatoos to glossy blueblack Ravens, the colours of the birds seem to blur among the bushes and grasses. Black and white Butcher Birds, Magpies, Mudlarks and Wagtails, silvery grey Cuckoo Skreiks, intensely coloured Pardalotes and Kingfishers, blue Wrens, red Wrens, pink and grey Galahs, multi-coloured Rosellas in intoxicating hues. And many LBBs, the little brown birds which sing so sweetly. Then right there, sitting on a blade of bright green grass, is a beetle the colour of dazzling lapis lazuli. It's a day to relish these jewels of the river.